The Turtles are visiting the Burroughs Aquarium and admiring the manta ray there when the proprietor tells them that the place is closing down. The lads make their exit and head for home, in search of dinner. 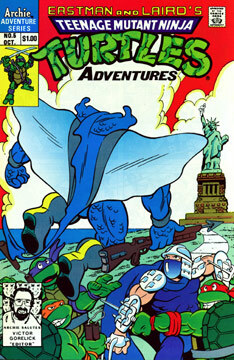 Meanwhile the Shredder, Bebop and Rocksteady are piloting a submarine beneath the waters of the New York Harbor. Shredder informs Krang that Bebop and Rocksteady accidently spilled an entire barrel of Mutagen in the city’s sewers, which doesn’t make the tentacled alien very happy. Saki then begins explaining his plan to ruin the Fourth of July holiday for all New Yorkers. Later that night, the aquarium proprietor pats the large manta good night and then goes off on an environmental mission. The man is trying to discern if companies are illegally dumping toxic waste into the Harbor. As he investigates a large drainage pipe, the environmentalist discovers an odd substance (that we recognize as Mutagen). Not knowing the dangers of the substance, the proprietor grabs a handful of the goo – just as the pipe is being flushed out! A huge rush of water pours over him and washes him out to sea! Just about that time, we see the TMNT excitedly running towards the beach to have some fun. As the guys are goofing off on the sand, they’re spotted via periscope by Bebop. Shredder decides to off the Turtles by shooting a torpedo at them. Just as the deadly missile is about to impact on the beach, an odd shadowy form from the depths grabs it and sends it careening back toward’s the sub. Fortunately for the villainous ninja and his cohorts, the torpedo bounces off the submarine’s tough hull. Enraged by these strange events, Shredder orders Bebop to steer the sub back to their secret base. However, once the ship is parked, a mysterious shape attaches a huge amount of plastic explosives to its side. Back in the sewers, the Turtles have gotten lost on their way home. As they walk along they see a huge black shape swim by. The boys find a grate, and when they peer through it they see Shredder’s sub! The TMNT dive into the water to investigate the submarine. Elsewhere, we see the shadowy form once again, as it prepares to detonate the plastic explosives attached to Shredder’s sub! By now, the Turtles have gotten inside the sub and it has set sail once again. The Green Team is discovered by Bebop and Rocksteady, and a fight breaks out. During the battle, Rocksteady’s horn bursts through the ship’s walls and water starts to pour in. The water-logged sub starts to sink to the bottom of the sea, as Shredder makes his escape. The Turtles grab life preservers and use them to save/capture Bebop and his boneheaded buddy. As Shredder flees, he meets the mysterious stranger face to face… it’s a mutated manta ray man, who calls himself (naturally) Man Ray. Shredder begins battling the angry Man Ray, but he’s no match for a creature who can breathe beneath the waves, and the villain is quickly subdued… but once Ray has Shredder on the beach, the nefarious ninja gets in a cheap shot and makes his escape. The Turtles speak briefly with Man Ray, but he’s weakened from his recent mutation and quickly returns to the harbor. The TMNT enjoy the fireworks on the Fourth, since Ray helped stop Shredder from completing his mission of destruction.